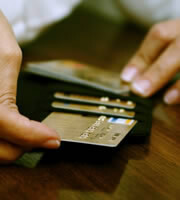 It can be tough to pay off credit card debt if you are getting hit with rising interest rates and various fees. Use the following tips to keep your credit card balance from spiraling out of control. It's important to always open credit card statements as soon as you receive them so that you are aware of the due date. Your credit card bill should give the exact date and, depending on the issuer, time when payments are due. Either pay your bill right away or set up a calendar system that helps you keep track of all payments that are due. Tardy payments can result in late fees. The Card Act of 2009 caps late fees at $25 for a single violation. However, you could be hit with a $35 late fee if one of your last six payments also was late. A late payment can seriously affect your finances if your credit card company reports your 30-day or more overdue account to one of the three main credit bureaus: Equifax, TransUnion or Experian. The hit that your credit score could take could cost you since you may not qualify for the best rates for a new loan. If high interest rates are eating up your money, contact credit card companies to ask for a better deal. You may be able to lower you interest rate if you have managed credit well. If you're not able to get a lower interest rate from your current credit card, you may consider looking for low interest credit cards that allow you to transfer a balance and get better terms. By avoiding fees and paying the lowest interest that you can, more of your monthly payment will go toward your principle balance helping you to get out of debt faster. Compare your card to the most current offers at IndexCreditCards.com. 0 Responses to "Late fees and high interest reverse your payoff progress"